Marty Nygard built the BCNU Mk1 in 2000. It is was designed and fabricated in University City, MO. Marty explains, "When I was in grade school, I received a ride in a hand built sports car special powered by a two stroke cycle Mercury boat motor. Ever since then, I have dreamed of building a race car with a similar spirit. 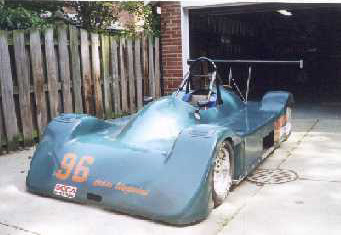 In 1996, I decided that the Sports Car Club of America�s D Sports Racer class would allow me to finish that dream. I developed a design outline, budget, and schedule and began construction of the BCNU Mk. 1 with a goal of performing as much fabrication, welding, bodywork, and painting as I could." 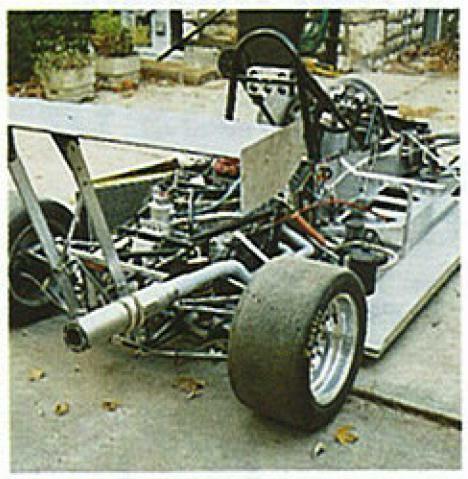 For ease of fabrication, mild steel �" square tubing was used for most chassis and suspension members. 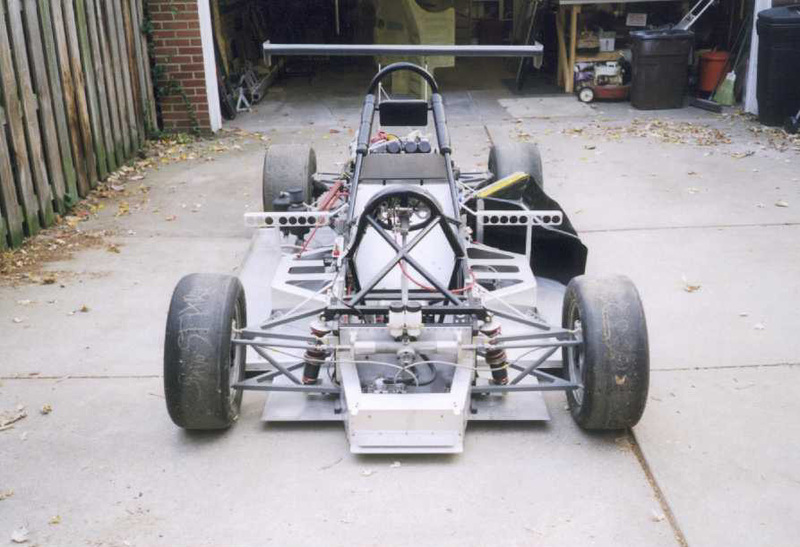 Aluminum sheet was bonded and riveted to the chassis to provide a stressed skin and was used elsewhere for a floor pan as well as front and side crush structures. 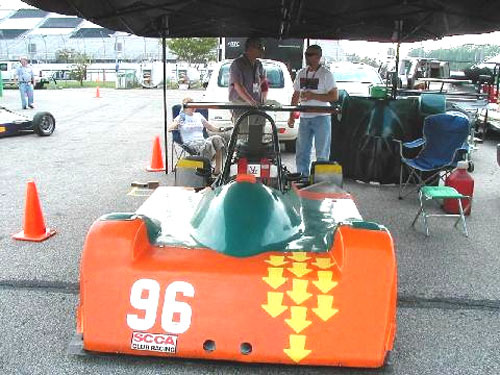 The roll-over bars were as specified by SCCA requirements. 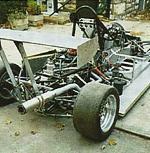 The front bulkhead was �" thick aluminum plate to allow direct mounting of the steering rack. A seven gallon fuel cell is mounted between the seat and engine. Instrumentation is minimal. Shifting is via a paddle actuated cable. The seat was individually molded to Marty's aging posterior and is of wet layup carbon fiber. Because of the opportunity to run at a lower minimum weight (900 lb.) with a chain driven car (vs. 1000 lb. with a transaxle car), and because of their amazing technology, Marty chose to utilize a motorcycle engine. For him, this became a Honda CBR 900RR (Fireblade) engine. It is essentially stock with a lightened flywheel, upgraded clutch and carburetor modifications. An external oil filter and Accusump accumulator were added to the lubrication system. The final drive is "locked" with no differential action and uses an elegant bearing carrier sourced from Omni Fab. The body shape was developed out of a desire to minimize the quantity of molds. The same mold is used for the front and rear halves of the car with only the location and size of openings changing. The body is a wet layup of fiberglass cloth and epoxy. There is also a front splitter with diffuser. The wing is a foam core with fiberglass covering. All aero was refined in the intuitive tunnel. Good regional car. 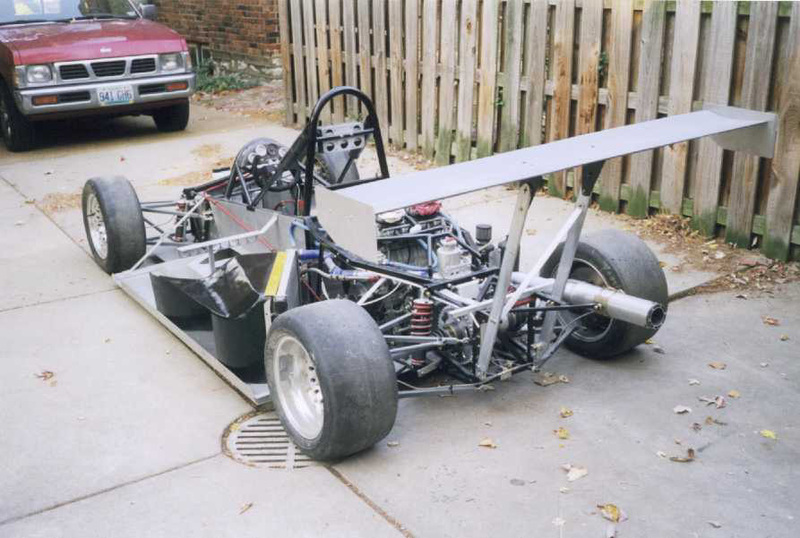 Its upright driver position would also make it ideal for autocrossing. Probably best for driver under 200 lb. and with less then 32” inseam. Body - Lightweight fiberglass, three piece with low frontal area. Molds are included. 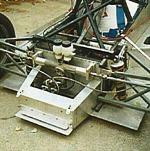 Chassis - Carbon steel space frame with stressed aluminum shear panels. 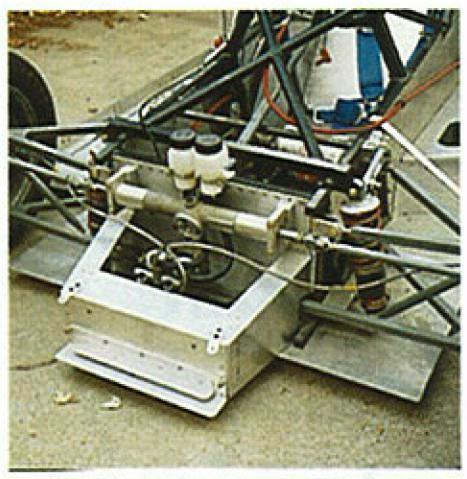 Suspension - Front and rear with upper and lower “A” arms. Fabricated uprights. Pullrod actuated Koni shocks. Adjustable anti-roll bars. Brakes - Solid Coleman discs with Wilwood four pot calipers. Wheels - Two sets Keiser aluminum wheels, one with slicks and one with low time rains. Engine – Stock Suzuki GSXR-1000 with Yoshimura ECU. Final Drive - Omni Fab sprocket carrier (locked). Spares - One full set suspension arms plus other misc. pieces. Trailer - A lightweight, single axle open trailer is also included. $13,000.00 obo, Take possession at the runoffs. The name of the car is based on one of Marty's favorite old television shows, The Prisoner. Marty Nygard at the 2005 Runoffs at Mid-Ohio. This shows the current Lola shaped nose configuration and has the cover for the stock Suzuki airbox. This rendering is what Marty hopes to build in 2004 (as of March 2004). 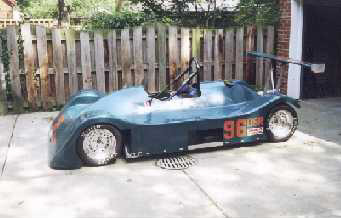 Marty says, "I wanted to build a Lotus 7 clone with a front engine, 2004 Honda 1000RR. With traditional 7 style body work it would be legal for the street and with the body shown (nose from the Mk1 mold, simple side pods and rear fenders, wing is still to come) would be legal for DSR. I have a couple more sets of the Mk 1 uprights and machined pieces so the suspension would be mostly a duplicate of the first car." Marty reports that "The Type R was contingent on selling the original [Mk1] which never happened. 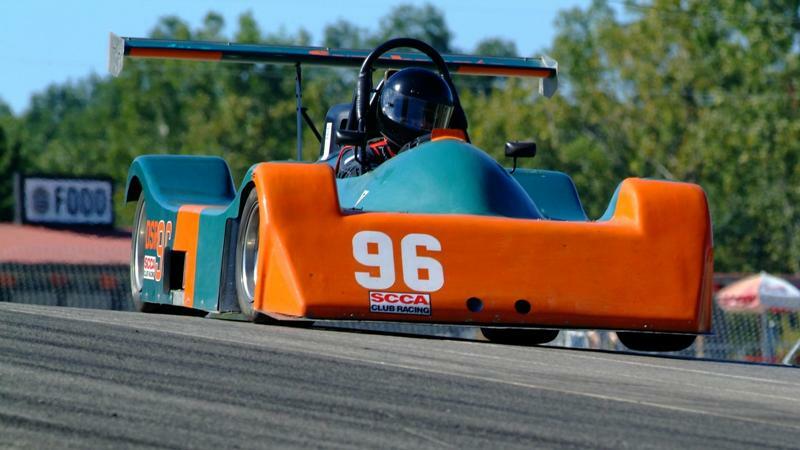 Now that I have stopped driving Regionals and Steve will retire from driving after the Runoffs, there is no reason for jumping through the SCCA hoops for the type R bodywork configuration (no cycle fenders, minimum width, etc). If the car doesn't sell this time, I'll get some new blades for the Sawzall and use the suspension, engine and other pieces to make a sort of street Type R which I can also periodically take to track days. I'll send pictures of the death and resurection." 1Marty Nygard provided this information directly to the Sports Racer Network. The information was also used in an article, RaceTech Magazine, December 2000/January 2001 issue, p 12.